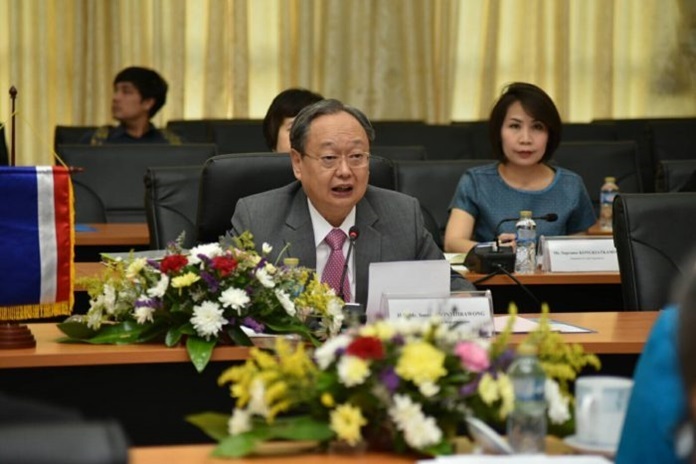 Bangkok, 8th September 2018 – The latest Thai-Lao business matching conference will result in 62 million baht’s worth of two-way trade, according to the Ministry of Commerce. Commerce Minister Sontirat Sontijirawong said this week the 7th joint meeting between Thailand’s Ministry of Commerce and Lao PDR’s Ministry of Industry and Trade on September 5-6 in Vientiane, was atttended by 90 Thai and Lao businesspersons, many of whom were able to form partnerships, which the minister believes will lead to at least 62 million baht in trade. Food and beverage, education, and construction businesses were among the most popular. During the two-day business matching event, Sontirat and his Lao counterpart co-chaired the signing of a tripartite memorandum of understanding (MoU) between Kamu, Sushi Mega, and Smart Brain. Lao PDR’s annual GDP growth rates for the last decade, have been higher than 7% and this year’s growth is estimated at 6.8%. The country has also seen more people move into the middle class. And with higher purchasing power, the country has been importing more Thai products and accessing more services in recent years.